Arsenic Problem/ Menace Essay. Welcome to our website. This is the one of the best and an unlimited the source of Essay and Paragraph. 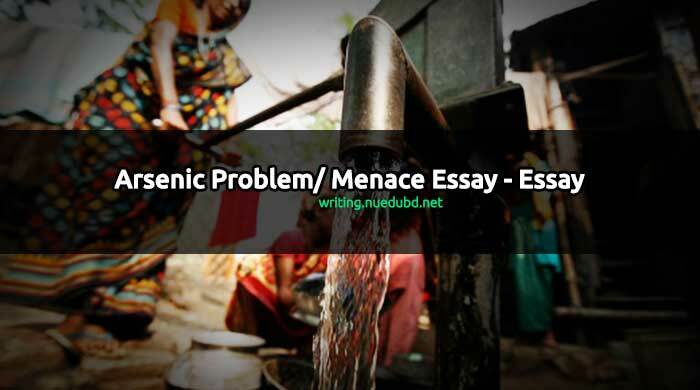 Now NU EDU BD writing section sharing the most useful Arsenic Problem/ Menace Short Essay for you. I hope you'll like it. Education is one of our basic rights. This is very short and easy essay for you. Now check this out Short composition on Arsenic Problem/ Menace for you. Introduction: Bangladesh is a small country with growing problems. Among all problems, arsenic is a great one. The problem has spread its veil clutch all over the country. It is going from bad to worse. All are getting concerned about this problem. What is arsenic? : Arsenic is a brittle semi-metallic element. It is poisonous. It kills a man slowly. Where found: Arsenic is becoming an acute problem in Bangladesh. Many districts of the country are affected by the problem. The groundwater is contaminated with arsenic. The tube-well water is also not safe, So, drinking water is going on across the country. Finding no alternative, many people are still drinking arsenic mixed water. Results: Everybody many people are affected by arsenic. Thousands of people have already been affected by it. Many have died. Many are suffering to die. This poison causes severe sore and black spots in fingers. The sore turns into cancer. Thus it pushes a man to death. It also damages our kidney, liver, stomach etc. A severe cough and hair falling can be caused by the poison. Diarrhea may accompany too. Ways of the solution: The following measure can be prescribed to solve the problem. Firstly, arsenic-free water must be ensured in affected areas. Secondly, medicine and balanced food should be given to the affected people. Thirdly, more deep tube-weels should be marked. Sixth, electronic and print media should play an important role. Last, of all, the government should take a massive programmer to make the country arsenic free. Conclusion: In fine, we can say that arsenic is a great problem. The problem should be solved at any cost. It is high time we solved the problem. Conscious people should work together with the Government in this regard. Otherwise, we all fall into a great danger.